Though Eli Grayson is one of the most handsome, charming, and intelligent men in Grayson Grove, no one will take a chance on a confirmed bachelor. Unwilling to give up his dreams, Eli convinces his friend Jewel to pose as his wife. Their masquerade is to last just one night… but when word gets out, Eli and Jewel must tie the knot to save his career—and her reputation. Angry at being forced to turn her life upside down, Jewel never imagined that a white-hot passion would consume her once she and Eli became husband and wife. Sharing a bed has turned their prim friendship into a sensuous love affair… but when a woman from Eli’s past returns to stir up trouble, he and Jewel will learn just how far they’ll go to protect the precious gem of their newfound passion. 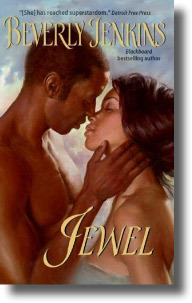 Jewel was one of Ms. B’s books that I’d never read. I’m not sure why that is since I’ve tried to get my hands on all of her books. And, like every other time, Ms. Jenkins did not disappoint. Returning to Grayson Grove, Michigan—the setting from Vivid—was a great ride for me. I was interested in seeing what happened to the people of the town after Nate Grayson and Vivid Lancaster rode off into the sunset. As always, the scenery descriptions zapped me right into the beautiful town and its surrounding areas. The book opens with a little mystery (sorry, I can’t spill) and then we are reintroduced to Eli Grayson—Nate’s handsome cousin. Eli, who had some less than admirable traits in the past, has tried to live on the straight and narrow. He’s a journalist by trade, but the local paper he ran has closed due to lack of funds. The Gazette is Eli’s passion and he’d do anything to try and get it back up and running. When the owner of a thriving Black newspaper enters the picture, intent on investing the money to help The Gazette, Eli sees this as a way to get back to doing what he loves. However, G. W. Hicks only invests family men—Eli has to have a wife. Enter Jewel Crowley, who we met in Vivid as well. Jewel is fiercely loyal to her family and takes care of her father, Adam (who is married to Eli’s mother coincidentally), and her brothers—and loves doing it. When Eli comes to her with a proposal—they would pretend to be married for one day then when Hicks leaves after investing in The Gazette it would all be over—she is skeptical but agrees to it. After all, who can resist Eli Grayson? (Not me.) Jewel has even harbored a crush on him for years. Of course, it couldn’t be that easy. That’s when the fireworks start for these two. One night of pretending becomes a real marriage of convenience—which I have to say is one of my favorite premises. Give me a marriage of convenience and I’m all in. Once again, Ms. B gives us a passionate love affair. These two are on FIYAH! Eli is strong and intelligent (my kind of man; gray eyes, hot body, and all). Jewel is smart and beautiful (and a fire cracker). Perfect Couple (and if you haven’t read my thoughts on perfect couples, click here). I was hooked from the beginning. There was mystery, intrigue, and the supportive characters were colorful and extremely important to the story. I especially loved that Maddie (another character from Vivid) was featured and had her own mini-love story. All in all, I was so happy that I had a chance to read Jewel. I enjoyed every bit of the story. Thanks Laura! I’m glad you stopped by. Hope to interact with you often!